Fr. Thomas digs deeper into the Great Schism and the issues that inhibit a unification with the Church of Rome. Fr. Thomas continues to talk about the Great Litany at the beginning of the Divine Liturgy. In particular the "union of all men" and "the fear of God." Fr. Tom takes some additional time to teach on the meaning and roles of the clergy and laity when it comes to Worshipping in Spirit and in Truth. Fr. 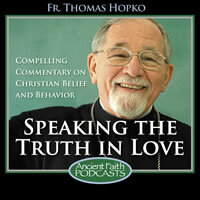 Thomas Hopko gives one Orthodox Christian's understanding of unity. In my last podcast for Ancient Faith Radio about the Ecumenical Patriarch and the Pope of Rome, I introduced a paper that I prepared for a conference in 2005 in Washington, D.C., sponsored by Roman Catholics, the Woodstock Theological Institute, and the Georgetown University, about what non-Catholics would require of the Church of Rome and of the Pope of Rome in order to be in sacramental communion with the Roman Catholic Church. At this conference, representatives of various non-Catholic churches, non Roman churches:, Episcopalian, Lutheran, Methodist, Baptist, Calvinist, Society of Friends, Quakers—I think there were about eight or nine of us—had this task: to say what we thought would be required for us to be in communion with Rome. I was the one invited to say what I thought the Orthodox Church would require. I did that, and I wrote a paper for it, even; I sent it to the organizers of this conference, which they read before they came so they’d have some idea of what I was going to say, but I was only given ten minutes to summarize it at the actual conference, as were the other people there from the various Anglican, Lutheran, and the Protestant churches generally. We each had ten minutes [to] summarize our position, and there was some kind of discussion, and then the conference was over. So the paper was never delivered, and it was never published anywhere—maybe that’s merciful; I don’t know—but I just thought I would share it at this point, with the listeners of Ancient Faith Radio. First of all, I believe the Orthodox would insist—or would have to insist—that the bishop of Rome would hold the orthodox faith of the catholic Church through history and teach and defend true Christian doctrine. This means that the pope would have to do several specific things, chief among which, I would think are the following. This is what I believe Orthodox would ask. First, the bishop of Rome would have to confirm the original text of the Nicene-Constantinopolitan Symbol of Faith and defend its use in all the churches, beginning with his own. At the very least, should some churches for pastoral reasons be permitted to keep the filioque in their Creed, if that were the case, he (the bishop of Rome) would have to insist on an explanation of the filioque that would clearly teach that the Holy Spirit “proceeds from the Son” only in relation to God’s saving dispensation in the world, in the oikonomia, in other words, the Holy Spirit who proceeds eternally from the Father is given to the world through the Son, for the sake of understanding the proper relations of the Persons of the Trinity. The pope would have to make certain that no Christian be tempted to believe that the Holy Spirit essentially proceeds from the Father and the Son together, and certainly not “from both as from one—ab utroque sicut ab uno,” which was a traditional position of the Roman Church at a later time when the filioque was discussed between East and West. In other words, the Creed without the filioque would have to be endorsed. If for some reason in some places on earth Roman churches would keep the filioque in the Creed, it would have to be clear to those who want to understand that this does not mean that there is an eternal procession of the Holy Spirit from the Father and the Son, and even not from the Father and Son “as if from one”; that would not be acceptable to Orthodoxy. Then I say that the bishop of Rome, the pope, would also teach that the Father and the Son and the Holy Spirit are three distinct Persons or hypostases and not simply “subsistent relations” within the one God, who is identified with the one divine nature. He would have to insist and ensure that the one true God of Christian faith is not the Holy Trinity understood as a quasi-unipersonal subject who reveals himself as Father, Son, and Spirit, which, for traditional Christianity, is unacceptable and in fact would be understood as a version of a Modalism, namely, there is one God, who is the Father, who is the Son, who is the Holy Spirit—no. There is One who is the Father, One who is the Son, One who is the Holy Spirit; their unity is perfect. Their divinity is perfect, but the divinity of the Son and the Spirit derive eternally, before the foundation of the world, before time or space, from the Person of the Father. The Father communicates his whole divinity to his Son and Spirit from all eternity and the God, for Christians, is the tri-Personal, tri-hypostatic divinity, tri-hypostatic Godhead. The pope also would have to insist that human beings can have real communion with God through God’s uncreated divine energies and actions toward creatures, which come from the Father, through the Son, and in the Holy Spirit. That little paragraph there would mean that Palamism would have to be accepted, because this teaching, the Palamite teaching, was conciliarly received by all Orthodox churches, that indeed there is a distinction between the essence and energies of God: the unknowable, super-essential Godhead that is hidden, and then the activities of God that we creatures can really participate in through the revelation of the Father through the Son in the Holy Spirit. Also I say that the bishop of Rome, the pope, would also officially say that the immaculate conception of Christ’s mother, Mary, from her parents, and Mary’s total glorification in the risen Christ at the right hand of the Father have been improperly explained in the papal bulls that originally accompanied the Roman Church’s ex cathedra dogmas on these two articles of faith. The pope would explain that Mary’s conception by her parents was pure and holy, without a need for God extraordinarily to apply “the merits of Christ” to Joachim and Anna’s sexual act of conceiving their daughter in order to free her from “the stain of original sin.” The pope would also have to make it clear that Mary really died and was not assumed bodily into heaven before vanquishing death through her own death, by faith in her Son, Jesus Christ. Here what I’m saying is: Orthodox Church would affirm that Mary was immaculately conceived from her parents, Joachim and Anna, but it did not require any special exceptional act on the part of God from the moment of her conception to free her from the stain of the original sin. We should note that some Orthodox churches, who are very anti-Roman, still have a version of this teaching, and they would say that the stain of the original sin was washed away at the Annunciation, not at the conception of Joachim and Anna, but in any case there would have to be an explanation of the immaculate conception and the Dormition, the assumption of Mary, bodily, into the presence of God, that would conform with Orthodox doctrine and liturgical practice. Also, next, the pope would also officially say, clearly state, that, though there may be a purification and cleansing from sin in the process of human dying, there is no state or condition of purgatory after death where sinners pay off the temporal punishment that they allegedly owe to God for their sins. The pope would also stop the practice of indulgences whereby, through certain pious activities, Christians can allegedly reduce the “days” of purgatorial suffering for themselves and others. Here, of course, this means that the allegory of the toll-houses in Orthodox tradition, which I believe is an Orthodox traditional teaching, is not that sinners have to be punished for the sins that they committed on earth before dying, according to those 22 toll-houses that were formulated in the second century in Constantinople, but that they would have to be freed from those passions and cleansed from them in order to enter into the kingdom of God, and therefore prayer for those departed, entreating the Lord to be merciful, entreating the Lord to give the grace to the people to accept Christ, and therefore to be delivered from their sins, this would be the Orthodox—I believe—understanding that would have to be shared with the Roman Catholic Church on this issue. Then I say that the pope would also make it clear that Christ’s crucifixion was not a payment of the debt of punishment that humans allegedly owe to God for their sins. The bishop of Rome would rather teach, with his co-bishops in the Western patriarchate, that Christ’s self-offering to his Father was the saving, atoning, and redeeming payment of the debt of perfect love, perfect righteous, obedience, gratitude, and glory that human beings owe to God, that God must have from human beings for their salvation from sin and their deliverance from death, and now, in fact, do have because of the redeeming death, in total love for God and humanity, of Jesus, the crucified Christ, who is the new and the last Adam. In other words, there would have to be an explanation of why Christ’s death on the cross is atoning, and the explanation would not be because humans have to be punished and Christ takes that punishment, but rather that humans have to be good and holy and keep the law of God, which only Christ does, and therefore by faith in him we can have our own sins forgiven and our own way into paradise and restoration guaranteed to us human beings. I also then continue and say that the pope would also ensure all Christians that the bishop of Rome will never do or teach anything on his own authority, from himself or in itself, and not from the consensus of the Church. “Ex sese et non ex consensu ecclesiae,” in Latin. The bishop of Rome would promise to serve in his presidency solely as the spokesperson for all the bishops in apostolic succession, who govern communities of believers who have elected them to serve as their bishops, and whose validity and legitimacy as bishops depend solely on their fidelity to the Gospel and the faith once and for all delivered to the saints, in communion with their predecessors in the archpriestly and archpastoral episcopal office and with each other. Here this of course means that the doctrine of the infallibility of the pope, as formulated in Vatican I and defended in Vatican II, that would have to be rejected or radically modified for the Orthodox to be in communion with Rome. Also, I believe, that on undecided doctrinal and moral issues—open questions, so to speak—the pope of Rome would use his presidential authority to ensure that everyone, clergyman or layperson, would be encouraged to freely present his or her arguments concerning Christian teaching and practice, as witnessed in the Church’s formal testimonies to Christian faith and life, that is, the canonized Scriptures (the Bible), the traditional liturgies, the universally received Christian Councils and canons, and the witness and writings of the canonized saints—not for everything that the saints have said and done, but specifically for the specific reasons that these saints are glorified in the Church and their teaching has been accepted by the universal Church. So it’s the pope’s duty to see that proper conciliar and synodical activity takes place among the bishops and the people in order for the Church to reach a decision on doctrinal and moral issues. Finally, the pope of Rome would use his presidential authority to guarantee a spirit of freedom, openness, respect, and love in and among all churches and all Christians and, indeed, all human beings, so that the Holy Spirit, Christ’s sole “vicar on earth,” may bring to remembrance what Christ has said and guide people into all the truth (John 14:25, 16:13). The pope would in this way truly be the great bridge-builder, the pontifex maximus. The point there is that the pope would ensure and guarantee and promote and defend and shepherd a spirit of freedom, openness, respect, and love in and among all churches, Christians, and all people, so that the Holy Spirit, who alone is Christ’s “vicar on earth”—the vicar of Christ on earth is the Holy Spirit—may bring to remembrance what Christ has said, which acts, then, through the whole body together. Now I continue about the Liturgy, and I write: In order for the pope of Rome to exercise “presidency in love” among the churches and Christian leadership in the world, his church, the Church of Rome, would also have to exemplify proper Christian worship. This, too, for Orthodox Christians would mean some very specific things. First of all, I believe, the bishop of Rome would have to insist that, except for extraordinary pastoral reasons, baptisms would be done by immersion in water in the name of the Father and the Son and the Holy Spirit. And he would also affirm that the newly baptized be immediately chrismated with the seal of the gift of the Holy Spirit and brought into communion with Christ by participation in the holy Eucharist. This includes infants who enter the Church’s sacramental life by virtue of the faith of the adults who care for them. The practice of a later episcopal laying on of hands, confirming the faith of the baptized—what is called today “confirmation”—may be permitted in churches desiring to continue this pious practice for customary pietistic reasons. Then I say: Concerning participation in the holy Eucharist, the pope would also insist that the faithful receive holy Communion from the Gifts—that is, the bread and the wine—actually offered at the Eucharistic Liturgy which they are celebrating. The faithful would not be given Communion at Eucharistic Liturgies from reserved Gifts which are kept exclusively for those unable to participate in the Liturgy for good reasons (usually sickness or infirmity, or because they are involved in service to others and therefore miss the Liturgy of the Church). In other words, the point here is: you can’t have a Mass and then give Communion to the people from the reserve sacrament that’s kept in a ciborium on the altar. The bread has to be offered and consecrated and lifted up at that Liturgy for the communion of the people present, doing that Liturgy altogether. I also say—and this is the next point—that the pope would also ensure that the faithful people always participate in the consecrated wine, the blood of Christ, at holy Communion. How this is practically done may differ in different churches, but it must be done without exception. As for the bread, unleavened wafers may be used for pastoral reasons in the churches with this customary practice, but the pope would affirm leavened bread, the artos, as normative for the Christian Eucharist. Also, I write: The pope would insist on the celebration of the holy Eucharist with psalmody, scriptural readings, and exegetical sermons according to local ecclesial practices as normative corporate worship for Christians on the Lord’s day and on the Church’s liturgical feasts. He, with his fellow bishops, would forbid private Eucharistic celebrations for particular intentions and for particular pietistic, political, or ideological purposes. He would support the celebration also of the prayer of the hours—vespers, compline, matins, and hours—in the churches. He would restore the practice of having the priestly celebrant in the Latin Liturgy face the altar—in other words, be turned toward the East—together with the faithful people during the prayers and Eucharistic offerings at the holy Liturgy. He would also consider enforcing the ancient ascetical and penitential practice of forbidding the celebration of the holy Eucharist in Christian churches on weekdays of the Great Fast, the Great Lenten season, except for the feast of the Annunciation. Finally, I give my opinion on structural and administrative changes that I would envision would have to somehow be attended to. So I write: Finally, the Orthodox would hold that structural and administrative changes must occur if the pope of Rome will be accepted and recognized as the bishop who exercises presidency in love among the churches, being the bishop of the Church of Rome, which the church has the presidency in love—not the man, but the church has the presidency in love—and that the bishop of this church, the pope of Rome, would serve as Christianity’s world leader. I would think that these changes would include the following. First, the bishop of Rome will be chosen by the Church of Rome. Each church elects its own bishop. His election, however, because of his church’s unique position among the churches, especially as it developed through history, and his position in the world today, may have to be affirmed in some way or other by the patriarchs and the primates of autocephalous, that is, self-governing, archbishoprics and metropolitanates throughout the world. But like the election of all Christian bishops, the pope’s selection and installation would be the canonical action of the community that he oversees, namely, the Roman Church, the Church of Rome. A “college of cardinals,” constituted by men from all over the world, appointed by the pope and having nominal ministries in Rome, simply would no longer exist. In other words, it wouldn’t be papally appointed cardinals who elect the next pope, but it would be the heads of the Orthodox churches affirming and confirming what the Roman Church herself does in electing its own bishop. So the election would be by the Church of Rome; the confirmation would be by the primates of the other regional churches on earth. The pope would surely have the right and duty to question the choice of a candidate for the episcopacy, especially for a regional presidency (that means the primates of the local churches) whom he considers unsuited or unworthy for the office. He may even have the opportunity to review candidates and to offer his opinion before an election occurs, especially of a presiding bishop in a territorial church. But the pope would do this like any other bishop or primate of a regional church. He would have no right or power to interfere in the internal affairs of any church or diocese other than his own. Next I say the pope, the bishop of Rome, would appoint commissions and departments composed of competent men and women from all the world’s churches in communion with Rome to assist him in his service as Christianity’s world leader and chief spokesperson. He would also organize regular gatherings of the primates of the world’s churches to support him in his global mission as the universal head of the Christian Church on earth. The pope would have a commission dealing with Church doctrine, Christian doctrine, and theological thought in the world’s various churches, but no Roman office would exist with the authority to take disciplinary action in doctrinal matters which, when required, would be handled by the local bishop. The church’s bishops—and not a team of theologians in Rome, appointed by the pope, acting on his authority and speaking in his name—would constitute the Church’s formal doctrinal magisterium. Obviously, that means we’re calling for the end of the holy office, and also even for the curia, that there would be conciliar bodies in Rome, living there, representing all the churches of the world, working together in these various areas. Then I say also: Each bishop would oversee the members of his flock. Each bishop would oversee the members of his flock. He would be especially attentive to the intellectual, charismatic, and activistic members of his church, and would exercise appropriate pastoral guidance, direction, and discipline in their regard. The local bishop would forbid holy Communion to a church member who denies Christian doctrines and/or practices that he and his brother-bishops, with the Roman pope as their leader, are called and consecrated to proclaim and defend. Should a bishop be charged with teaching false doctrines (heresy) or engaging in immoral behavior or allowing those in his pastoral care to do so, he would be judged by the synod of bishops to which he belongs, in other words, the regional synod, who would discipline or depose him. In other words, he would not be judged directly by the Vatican or by Rome; it would go by way of the bishops of the synod to which he belongs, even should he be the president of that synod. If found guilty of wrong-doing, his own synod would discipline or depose him. If he wishes to appeal his case, he may turn to the bishop exercising presidency among the churches of his region, and as a last resort, he may appeal to the bishop of Rome, as the Church’s highest president, the ultimate board of appeals, so to speak. The pope would not have the power to make authoritative jursidictional or juridical decisions, but would exercise the ministry of intercession and reconciliation. The same right of appeal to regional presidencies and ultimately even to the bishop of Rome would, of course, be available to any church member, clergy or lay, who is charged with wrong teaching or wrong-doing. The next point I make is this: The bishop of Rome would also cease being an official head of state. As Christianity’s global leader, however, it is well that he would live in a place with minimal risks of governmental and political interference in his ministry. And that’s very important for Orthodox, whose bishops are always being somehow controlled or attempted to be controlled by the countries in which they live. So we would say here that it would be well if he was not an official head of state and would live in a place with minimal risks of governmental and political interference in his ministry. The place where the pope would live, and where the global inter-Church commissions and departments would also be located, would be governed by a lay person, assigned by the Roman Church. Heads of state would relate to the pope solely as a Christian bishop and a spiritual leader, and not as another head of state. In other words, there still would be a place like Vatican City that would be a city in and of itself, but its political and secular head would be a lay person, chosen by that Church. It would not be the pope, who would have a specific, churchly, spiritual, pastoral, doctrinal function. Then finally, in this area, I say: As leader of the world’s Christians, the pope of Rome would travel extensively. He would take full advantage of contemporary means of transportation and communication. He would master electronic media to serve his ministry in proclaiming Christ’s Gospel, propagating Christian faith, promoting ethical behavior, protecting human rights, and securing justice and peace for all people. He would be the servant of unity among all human beings, and first of all his fellow Christians, not as a unique episcopus episcoporum—that’s an expression of St. Cyprian—not as a bishop of other bishops—there is no bishop of other bishops, as was decreed already in the Council of Carthage in the third century: he is not the bishop of bishops; he is one of the equal bishops with all the others—so he would not have that position, but he would have the position as the leading bishop in the world, that Pope St. Gregory the Great called servus servorum Dei, the servant of the servants of God, among all the Christian bishops in the world. Now, enormous goodwill, energy, and time, I write, would be necessary to refashion the papacy so that the pope of Rome might be Christianity’s world leader as the bishop whose church presides in love among all the world’s catholic churches who hold and teach the orthodox faith. As recent popes have insisted, radical repentance would also be required, beginning with the Roman Church itself, whose calling as first among Christian churches is to show the way to all the others. Now I continue: the Orthodox churches would surely have to undergo many humbling changes in its attitude, structure, and behavior to be in sacramental communion with the Roman Church and to recognize its presidency among the churches in the person of its pope, its bishop, should such changes occur. In other words, these changes would cause tremendous changes within Orthodoxy, also. The Orthodox would certainly have to overcome their own inner struggles over and against ecclesiastical power and privilege, because the Orthodox bishops today can hardly agree where they would sit at the table if they had a council. It’s a scandal, really. And the Orthodox would have to candidly admit their sinful contributions to Christian division and disunity through history, and to repent of those things sincerely. They would also have to forgo all desires or demands for other churches to repent publicly of their past errors and sins. They would be willing to allow God to consign everything of the past to oblivion for the sake of bringing about the reconciliation and reunion of Christians at the present time. Here also we would have to mention that the practice of having churches, organized according to ethnicity and [culture], like Greek, Russian, Syrian, that would have to be radically changed—in Orthodoxy, I mean—and really understood in the proper way, which I believe today it is not understood properly. In a word, the Orthodox would have to sacrifice everything except only the faith itself for the sake of building a common future together with Christians who are willing and able to do so with them under the leadership of an Orthodox Pope of Rome. What we need is an Orthodox Pope of Rome. Like Roman Catholics and Protestants, the Orthodox would have to be willing to die with Christ to themselves in their personal, cultural, ethnic, and ecclesiastical and political interests for the sake of being in full unity with all who desire to be saved by the crucified Lord within the one, holy, catholic, and apostolic Church which is, according to Scripture, the Church which is his—Christ’s—body, the fullness of him who fills all in all (Ephesians 1:23). The Church which is “the household of God,” that is, the Church of the living God, the pillar and the bulwark of the truth (I Timothy 3:15). Then I end my paper with this one sentence. With the firm conviction that with God all things are possible, we can dare to imagine, perhaps even to fantasize, about a global unity of Christians in the faith once and for all delivered by the saints under the presidency of an Orthodox Church of Rome. So this is what I say in this paper, and I present it for discussion about what we Orthodox would like to see in the Church of Rome or be required to see in order to be in sacramental communion. But perhaps another paper and many other papers could be written about what we Orthodox would have to do for that to happen, because our record in the public life of unity, harmony, integrity, unanimity in all matters, it is not a very great record to see. While we all still hold doctrinal unity and moral unity in our teachings, in our structure and in our organization, and in our actual practices, there is, of course, very much to be desired from us Orthodox in the present world, among ourselves and in relation to the Church of Rome, and, indeed, in relation to all Christians and to all peoples of the earth. So that’s what I had to say, that’s what I say to you now. May God bless our path, the God with whom all things are possible.